"thank you (for) sharing that presentation with us because it will probably change most of our lives forever, including mine." "I think it was the most powerful performance I have seen in delivering a message that students are able to relate to as well as the performers ability to hold the audience's attention. The multi-award winning human rights show, project ARC, is looking for some new volunteer actors, aged 12-18, to join us for our 2018-2019 touring season! In project ARC, understudies perform parts of the show throughout the touring season and are guaranteed at least one show in the role they are understudying! - deliver a memorized excerpt from the show. - tell us why you would like to be a part of project ARC. With over 160 performances at elementary and junior high schools across Nova Scotia, project ARC has increased human rights awareness while raising $27,000 for organizations like Doctors Without Borders, Free the Children, Hope for Wildlife, Phoenix Youth, and Right To Play. 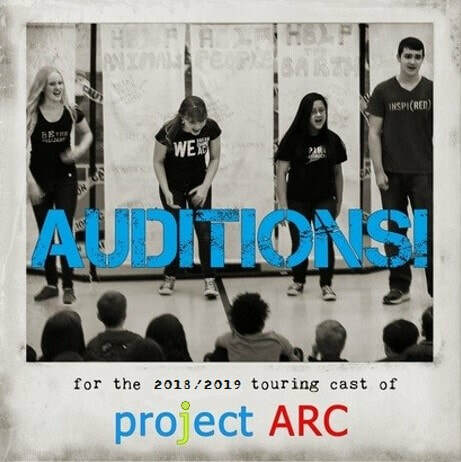 project ARC rehearses or performs at schools every second Thursday morning from November - early June. Rehearsals are on Sunday evenings and/or Thursday mornings and will start in late-September with performances scheduled to begin in mid-November. Cast members are usually responsible for their own transportation to and from shows, with the exception of possible road trips. Participation in project ARC is a great way to build skills and get volunteer experience. Experience with this show has helped cast members fulfill the requirements of the Duke of Edinburgh Award, receive awards (including the Nova Scotia Human Rights Award), gain acceptance into university programs, apply for scholarships and build their resumes. Students have used their work with project ARC as a high school co-op credit.